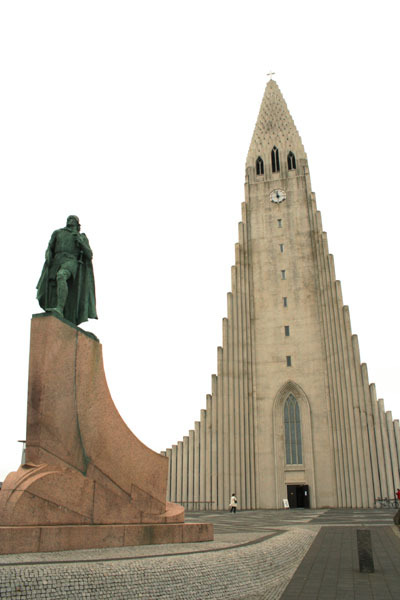 The statue of Leifur Eiriksson, first European to find America. Reykjavik's Hallgrimskirkja in the background. Das Denkmal für Leifur Eiriksson, den ersten Europäer der Amerika besuchte. Dahinter Reykjavik's Hallgrimskirkja. 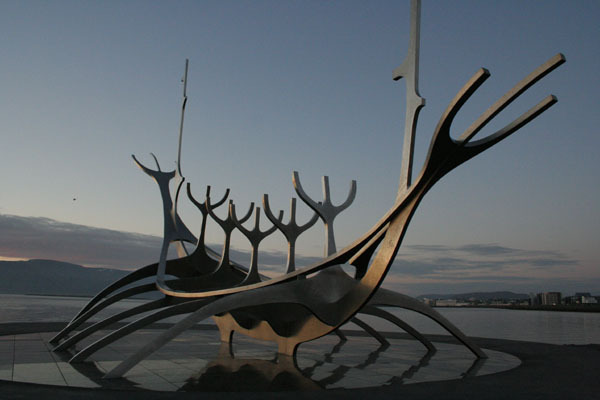 The Sólfar sits right at Reykjavik's watefront, here illuminated by the midnight sun. Der Sólfar in der Mitternachtssonne am Strand in Reykjavik. Þingvellirkirkja (Þingvellir Church), as seen from the Lawrock (Lögberg). Die Þingvellirkirkja (Þingvellir Kirche) vom Lögberg gesehen. 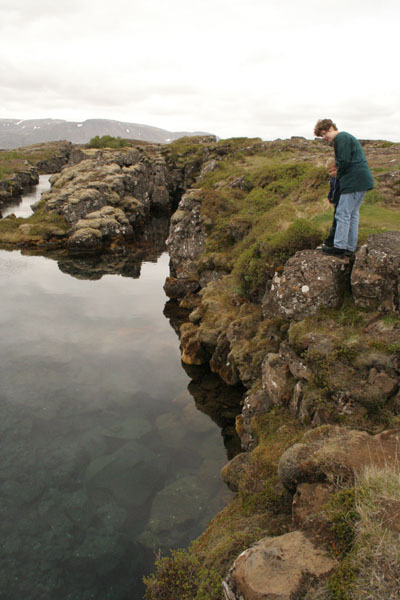 Archeologists are said to have found indications that the rock in the background may have been the original Lögberg of the Alþing, before christianity was adopted. Archeologen haben angeblich Hinwese gefunden daß der Felsen im Hintergrund hier mölicherweise der alte Lögberg des Alþings war, bevor Island das Chritentum übernahm. The first Þingvellirkirkja(Þingvellir Church) was built in this location shortly after in the year 1000 A.D. the Icelanders decided to adopt christianity as the national religion. 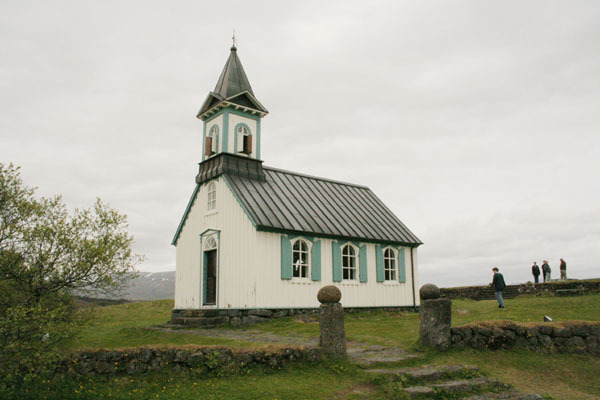 Wo die Þingvellirkirkja (Þingvellir Kirche) heute steht wurde die erste offizielle Kirche Island's errichtet, nachdem in 1000 A.D. Island das Christentum als Staatsreligion übernahm. 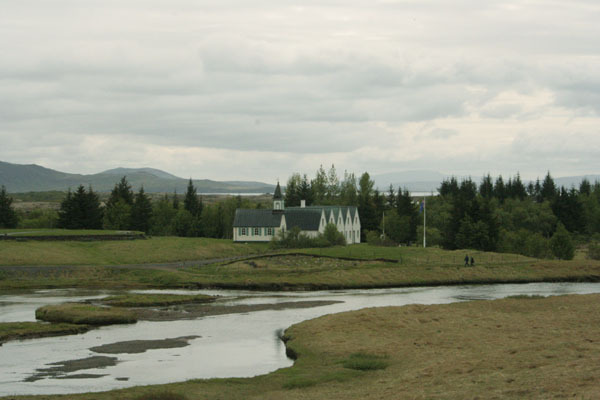 Þingvellir was the place where the Alþingi convened from 930 A.D. to 1799. 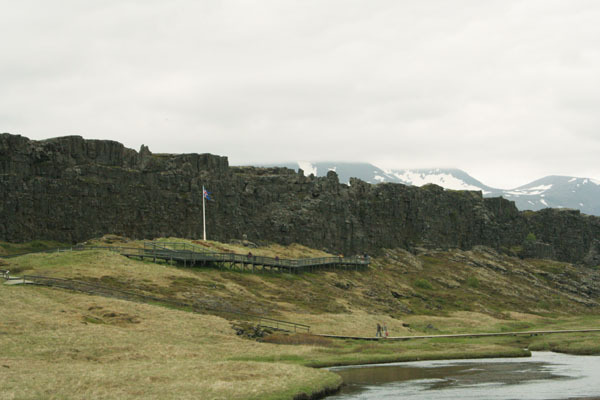 Today, a flagpole marks the location of the Lögberg, the law-rock, where the Law Speaker, at the beginning of each session would recite the laws of Iceland to the assembled members of the Alþingi.